Every business can benefit from reaching a bigger audience of potential customers. But how do you make that a reality for your business and sales team? The key is in using smart, automated campaigns throughout a customer’s buying journey. Automated, event-driven campaigns that recognize the stage your leads are in give better results than run of the mill “one message to everyone” campaigns. The customer journey provides a guideline for plotting a successful email marketing automation roll-out. If you sit down to think about it, all of the moments where a customer interacts with you are a potential point for marketing automation. In the customer journey, we describe the complete set of interactions between a customer and a company. The known prospects group will be your focus for new sales. They have shown interest and you are in touch, but they aren’t customers yet. The challenge is to draw them in and progress them through the sales funnel. Notice I didn’t include the actual conversion as a goal? The trick is to not ask for too much at once, but rather go for small wins and build up the relationship. There are typical campaigns that can make a real difference, usually tied to a direct interaction. These are what you call moments of truth, the ideal place to start. Here are some examples of strong campaigns to start with. The customer journey is such a good starting point because it allows you to go through your (potential) customer’s experience and the steps they make there. It allows you to explore if there is anything you can hook onto (on their buying journey) and help with. If you execute well, it creates a relationship that could never be achieved with traditional marketing tactics. Basecamp (previously 37 Signals) are believers of promotion through education. They give away their e-book, Getting Real, in exchange for a newsletter signup. Education is an excellent way to build up your name with your audience. Instead of a hard sell, you're getting attention by providing a (valuable) service. For instance, Pipedrive offers a two-week Sales Pipeline Academy It is a win-win so to speak, and most people remember those that have helped them in the past. If you have any whitepapers, downloads, tip sheets, checklists on your site, be sure to ask for email and contact data up front so all downloaders enter the realm of “known contacts”. But for most companies, it stops there. This is a significant missed opportunity to nurture the initial interest. Here is an outline of a four email “drip campaign” after a download form is filled in. Immediately send an email with the download link. Make initial contact with an automated (personal) email. Include a warm greeting, the description of the download, explain follow up and contact info. If they haven’t downloaded yet, you can send a reminder a few days later. Send over some more information/resources. Ask a simple associated question – in order for them to respond. You can mix this up to be a combination of personal looking emails and more designed/marketing looking emails. Tor Refsland seems to have this down to an art. His popular blog on influencer marketing has a registration that triggers a conversational email flow of tips that encourages customer response. He even has an online blogger outreach course. You want to make sure you get some feedback and/or more information from your contacts at this point. It is better to start scoring the contacts at that moment. Persistence with your follow up messaging is often what drives success. Live events, presentations, and webinars are a great way to raise awareness and engage with prospects. They give you the opportunity to show your expertise and get more opt-ins. This doesn’t have to be your own event either, it works just as well if someone at your company or a client is a guest speaker at an external event. Most companies, however, don’t take the opportunity to reach their full audience via direct campaigns. If you don’t manage the registrations, try to get the organizer to send the follow-up. A mix of different content types keeps things interesting for your current email subscribers. You can create online events or webinars, put them on your marketing calendar and later on publish them as “gated” content on your website. 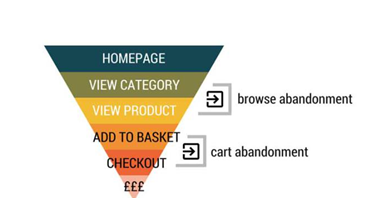 Unbounce does a good job with this. They feature knowledge sharing videos on their site. 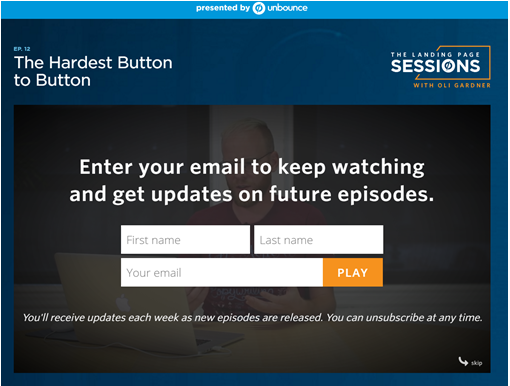 After each video, there is a layover requesting an email sign-up. After you sign up, you get an email as soon as new videos are released. 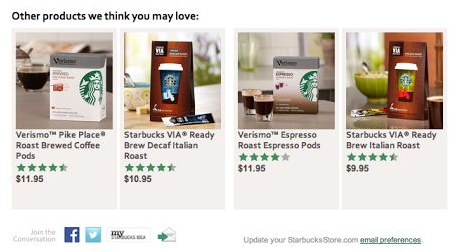 Very popular in B2C is the abandoned cart email. On average 68% all online shopping carts are abandoned, so it makes sense to try and act on that. Once people are closer to a purchase it is easier to help them by sending a little reminder to complete their order. 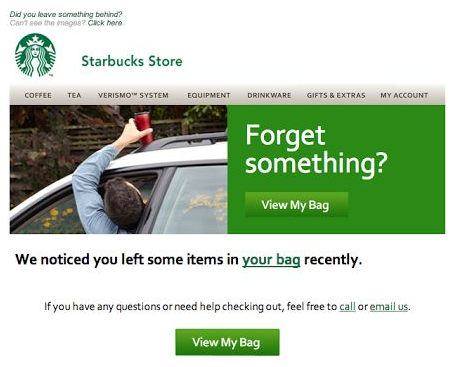 Abandoned cart emails can lead to a 8% overall increase in conversions. A “cart” is not always literally a shopping cart. In B2B or with high ticket personal sales items it could very well be a request for a quote or a form to request a pricing sheet. A lesser-known variation is the browse abandonment email. You target people who have recently visited your site or specific pages of your site. Although they are earlier in their decision process, they may have visited your company’s pricing page and left their email to learn more. Even if they aren’t prepared to buy, it doesn’t hurt to reach out and give them more information about your product. It may turn them into a customer. To be able to do browse abandonment and cart abandonment emails you have to be able to know who is visiting your site. This can be handled by most marketing automation systems. Instead of emailing them directly, you can take that information and bring it up during a follow-up conversation. That will help get customers back on track and guide them toward a final decision. Through the customer journey, we can understand the steps your leads and potential customers go through and “walk a mile in their shoes”. With all the digital touchpoints of today, interactions aren’t static, there is a seemingly infinite number of variants. But you don’t want to look like an overeager-journey-stuffing-inbox-filler. Start off with a few campaigns that really make an impact. When a lead shows activity and more interest, they will become more receptive to your messages, so take those as a starting point and work on from there.